Sometimes it feels like we’re inching closer to a future like the movie Her, where humans spend their time wandering around, constantly chatting to their own personal AI assistants. Today, services like Siri, Alexa, and Google Assistant are getting better at responding to some types of requests, but because they can misunderstand questions and aren’t cognizant of their surroundings, they’re often super awkward to use in public spaces around other people. But a patent filed by Apple and made public today suggests Siri may someday detect when you’re whispering at it, and in turn know when to whisper back. Apple has sought to patent “a digital assistant that is capable of detecting a whispered speech input and providing a whispered speech response.” In the document, Apple provided a few scenarios when a whispering assistant might come in handy, like “while studying in a library where speaking loudly may be prohibited” or “while working at a cubicle with other co-workers surrounding the user.” The application also cites “protecting the user’s privacy” as a reason why Siri might need to better detect and understand a whispering user, and why it’d be necessary for Siri to quietly whisper back. Just because Apple has filed a patent for this technology doesn’t guarantee it’ll wind up inside Siri soon, or ever. Apple, like all tech companies, regularly files patents to protect ideas that sometimes never make it into consumer products. In 2009, Apple patented a “sponge-like” iPhone dock. In 2012, Apple got a patent for 5D technology (there are only four known dimensions). Patent filings, however, do indicate some degree of interest in a given technology, as well as a desire to protect it. It’s one of the few ways secretive companies like Apple disclose unreleased concepts to the public. 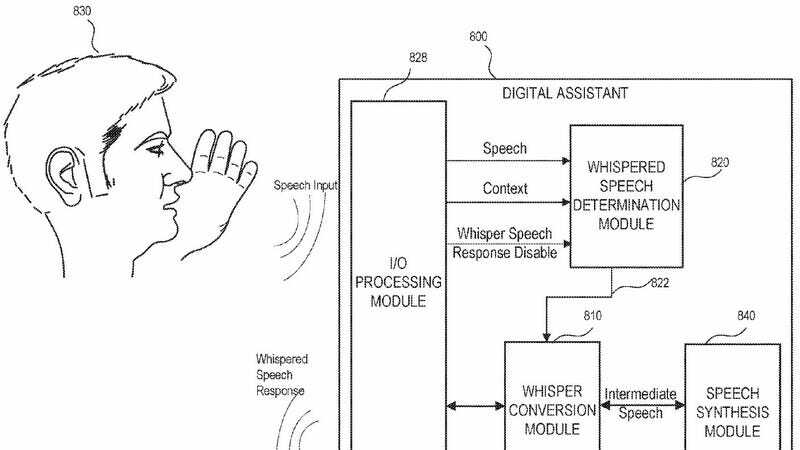 And despite this filing, it’s possible other companies, like Amazon or Google, could release similar assistants with their own whisper-detection methods.